ICE Director on Illegals Being Afraid of Deportation: GOOD! Damn, it is refreshing to see our government officials talking sense when it comes to illegal immigration. The media, the Democrats, and the Obama administration were – and are – so far outside the realm of sanity on this issue that it’s almost shocking when you hear the acting director of U.S. Immigration and Customs Enforcement telling Congress that if illegal immigrants are afraid of being deported…that’s a GOOD thing. That’s how it’s SUPPOSED to be. Of course, it will probably be only a matter of time before La Raza and Univision are calling for Thomas Homan to resign in disgrace. After all, the man in charge of deporting illegal immigrants should be ashamed of himself for even holding such a job, not taking pride in it. 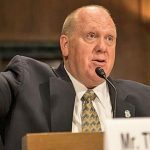 Homan praised the direction of President Trump’s policies, which have removed the ham-fisted restrictions his predecessor placed on ICE agents. Under Obama’s rules, agents were specifically forbidden from arresting and deporting illegal immigrants who had not committed serious crimes. Under Trump, the handcuffs have been taken off the agents and put on the illegals where they belong. And it’s already having a significant impact, said Homan. Of course, Democrats are still fighting the deportations tooth and nail. Rep. Nita Lowey, the top Democrat on the committee, assured Homan that her party would block any attempt to secure the border. “Democrats will not accept a penny of funding for a new deportation force or a border wall,” Lowey said. And in a question to Homan, Maryland Democrat C.A. Dutch Ruppersberger (if that is his real name) said ICE should not be deporting illegal immigrants convicted of drunk driving. “DWI or traffic is not really considered to be the type of people that are hurting our country,” Ruppersberger said. Not hurting our country? Interesting that Ruppersberger, who was one of the Democrats who made a scene last year with their “sit-in” over gun control, thinks that. Roughly 10,000 Americans are killed every year in drunk driving accidents. Strangely enough, that’s approximately the same number of Americans who are killed in shootings, when you remove suicides from the stats.